We have made it in Print! So about a week ago, I was told by our good friend and customer, Sheri, that we were in the new Canadian Scrapbooker magazine. She said there was a photo and little blurb mentioning our store by name. I did not believe her....but why would she lie? I HAD to get my hands on a copy to see for myself. After many attempts of trying to find our national magazine, I found it....at the Real Canadian Superstore of all places! And sure enough, on page 38, there was a beautiful picture of our booth at Scrapfest. The article was about Scrapfest and how amazing this Canadian grown event is! And that it is! We had a blast at this years event. Our picture focused on our jars of candy, I mean ribbon, that seems to be one of our hottest sellers. I admit we have a little bit of an obsession with ribbon. If you are ever looking for a specific colour of non-wired ribbon, I will bet money that we have it.....it may not be out in the jars, but we will more than likely have it in our back storage room! Just ask and we would be glad to "hunt" for it! I wanted to include THE picture of our jars from the magazine, but was worried about the whole copyright/reproduction thing! 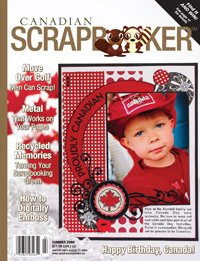 So if you are out and about, pick up the Summer 2009 issue of Canadian Scrapbooker and enjoy! PS...We were not the only Chathamites to get a photo in the magazine...our customers, Tara and Karen are shown on Page 39 showing their spirit and love of the hobby! Nice picture girls!